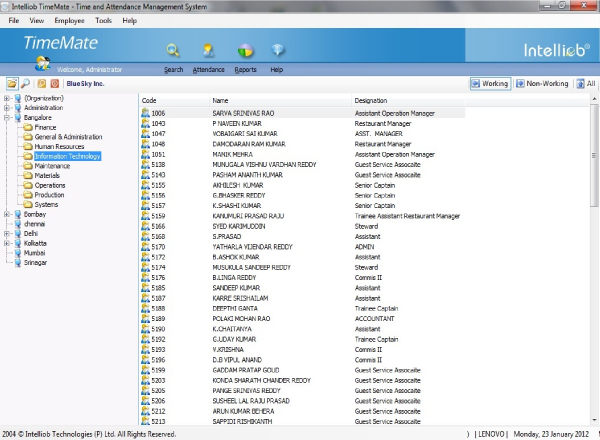 Online Workforce managment software | Time & Attendance | Time office Management in India. 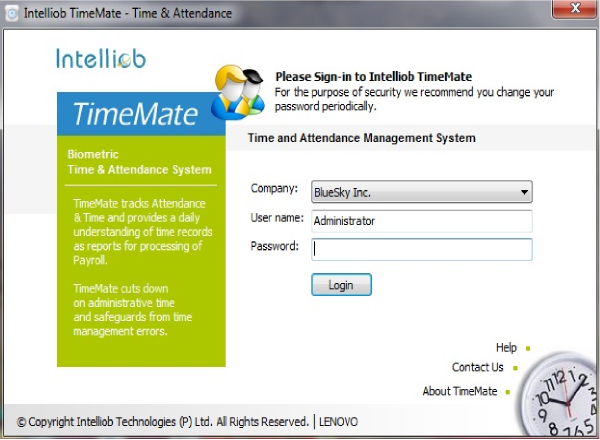 Intelliob TimeMate helps track employee time and attendance in most industry environments and can seamlessly integrate with many hardware devices. 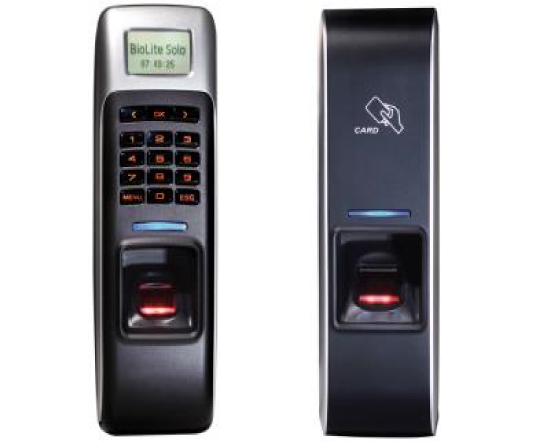 Whether you are looking for a fingerprint biometric device, swipe cards, proximity or hand punch devices to eliminate buddy punching, TimeMate integerates with various solutions that can be used to manage employee time management. 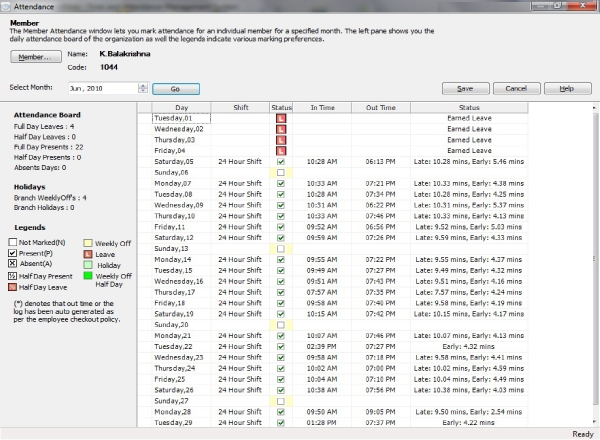 TimeMate allows configuration of work timings, as per user-defined shifts with provision for allotting time off, lunch and other breaks. The Time management policies can be user configured to suit individual organizational needs. Policies can be defined on overtime, late comings, early goings and other restrictions based on department, designation or at individual level. 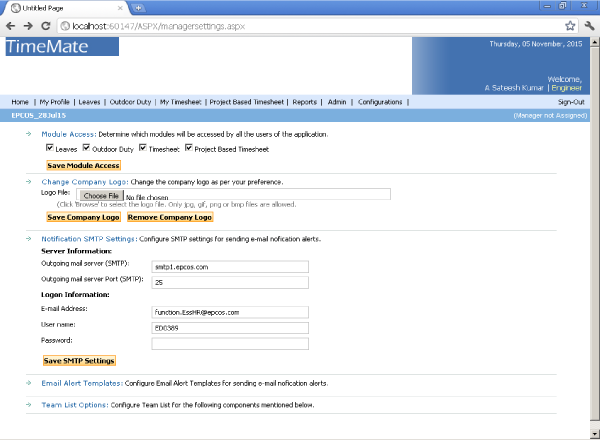 Time Mate Web Extensions enables access via Intranet or Internet using web browser. It has been designed to provide facilities for user on the move. It can be implemented at huge or wide area wise dispersed systems with a large number of clients. 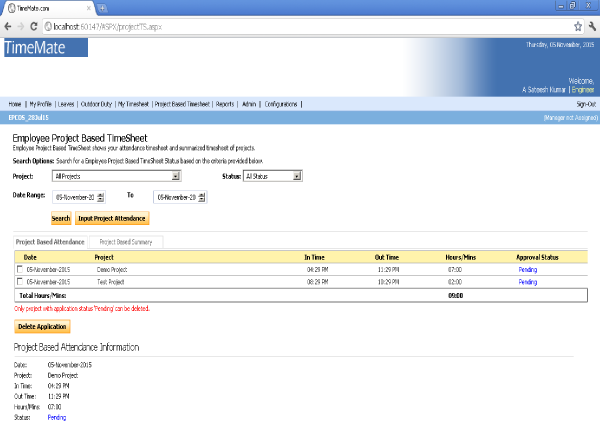 Why Time and Attendance System? Delivers key benefits to employee development and increase productivity. Managing time and tracking attendance manually is a frustrating activity known only to a Business Owner or a payroll Manager. TimeMate attendance management software records time and attendance details from fingerprint biometric devices or other time keeping devices to manage employee time and productivity efficiently. TimeMate modules include various features to coordinate all aspects of employee time management including In-Punch, Out-Punch, Late Comings, Early Goings, leave Management, Overtime, Holidays, Roistering and more. This allows HR to focus more on core HR related issues then to just handle and resolve queries related to employee time office. 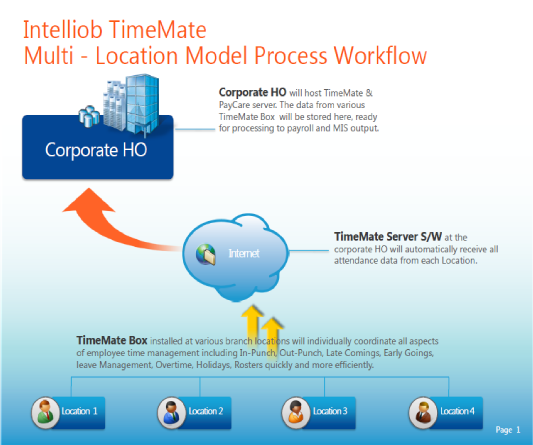 Intelliob TimeMate is a very advanced time systems solution built on latest technologies that can provide various analytical reports, statics and information to assist in managing and regularizing employee time office management of any organization. The Time management policies can be user configured to suit individual organizational needs. Policies can be defined on overtime, late comings, early goings and other restrictions based on department, designation or at individual level. Time management policies can be user configured to suit individual organizational needs. Time & attendance policy can be defined on overtime, late comings, early goings and other restrictions based on department, designation or at individual level. TimeMate is integrated with Intelliob PayCare Payroll software and can also be seamlessly integrated with your current payroll system, saving you time and eliminating common keystroke mistakes made during data-entry. 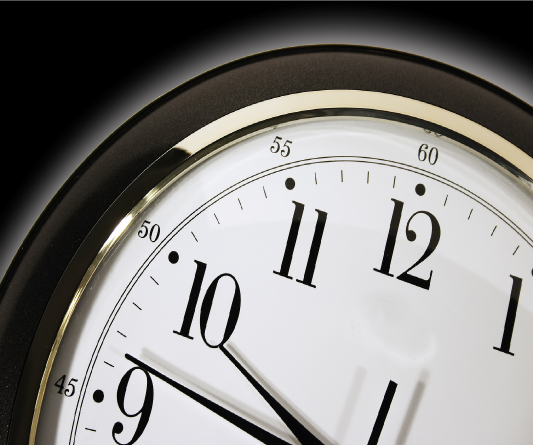 All Payroll Processing Software accepts standard time attendance software data that is produced. This data is provided in MS-access or text format. Most Payroll Processing Software in India will accept text data. Intelliob provides Payroll Processing in India through wide network of partners spread across major metros. Interfaced with PayCare or existing Payroll Processing Software. Compute Extra Work Time or OT. 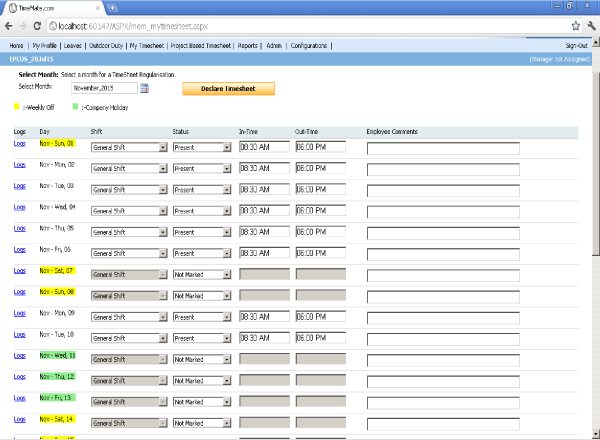 Manage Shifts & Duty Rosters. TimeMate Box Edition is specially designed keeping in mind the requirements of small office environment and application areas like distributed retail chains or small office across various regions with fewer employee count. You just need a USB enabled computer which is very common today at each of the locations where you would want to install TimeMate. TimeMate Box Edition comes with the U are U 4500 USB fingerprint time attendance device for time recording and is very economically priced considering this specific market need. Define Duty Roster to schedule employees to various or specific shifts. Record, manage and maintain daily time office records with complete accurucy and as per organizationl time and attendance policies and procedures.